Suzi Finlay from Belfast and Noah Bartlett, from Paris, met through mutual friends when Noah moved to Northern Ireland to study in 2014. They hadn't really spoken however until they were put sitting together at a wedding in Ireland in 2015. It was there they immediately clicked, and spent the entire day chatting and dancing together. Their relationship blossomed, and the next year Noah surprised Suzi with a romantic proposal while they were hiking on Malin Head in Donegal. "His best friend Scott - who became our best man - travelled up ahead of us to plant a guitar at the edge of the cliff and Noah proposed with a song he had written. He had also arranged for my parents to arrive at the holiday home later that day, knowing I would want to share the good news with them. Their 'proposal weekend' finished with a day at Shandon Hotel and Spa on the Wild Atlantic Way. The couple tied the knot on April 5, in Orangefield Presbyterian Church in Belfast followed by a reception in Tullyveery House in Killyleagh. 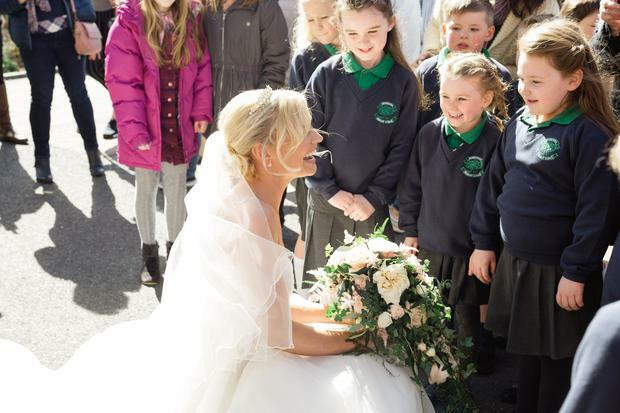 In one of the bride's favourite moments from the day, she was joined by pupils from her Year 1 and 2 class, who turned up at the church especially to see their teacher in her big white wedding dress. US based Photographer Ashley Gillman (Ashey Elizabeth Photography), whom the bride met on a trip to Africa years back, was on-hand to capture the day in its entirity. "Ashley and I met in Uganda in 2011 and I had followed her work online ever since," says the bride. "After we got engaged I was over the moon that she was happy to travel to Ireland to shoot our wedding!" Suzi says she loved every minute of planning the wedding, from meeting all the suppliers to working on the DIY projects. 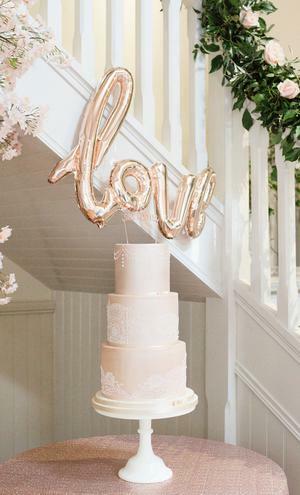 "We tried to include a subtle French element to reflect Noah’s up-bringing through our Parisian table plan," she says, "we had a French cake-topper and served crepes in the evening." 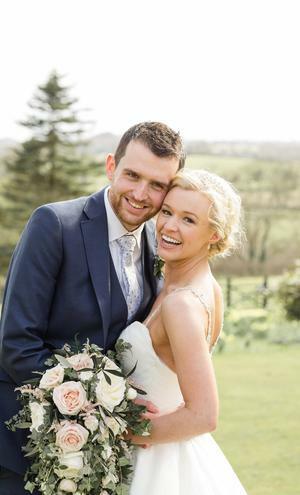 Suzi admits she loved shopping for her wedding dress so much that she almost didn't want the process to end! Eventually however she did find her dream gown - a stunning sweetheart neckline dress with a full tulle skirt by Allure which she purchased in Angel Star Bridal on the Lisburn Road in Belfast - who have actually featured in some of her other 'big white dress' occasions before! 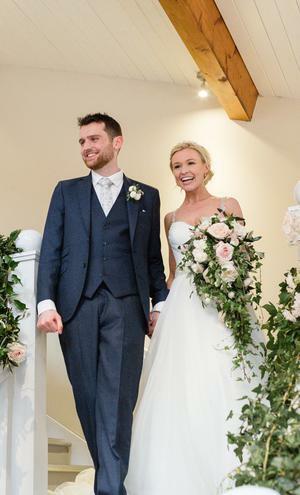 "I could not recommend Angel Star more highly," she gushes, "Gittan and Catriona were always so positive and helpful and they have an incredible range of styles and designers. Gittan had actually made my flowergirl dress when I was five years old, so it was very special to have her help create my perfect wedding dress!" For the bridesmaids, Suzi said she knew she wanted something "memorable and unique". Her mum spotted the embellished lace and bead dresses in House of Fraser and Suzi loved them instantly. A friend of the bride's made beautiful tulle skirts for the flowergirls, which they paired with ballet leotards and satin ballet shoes. 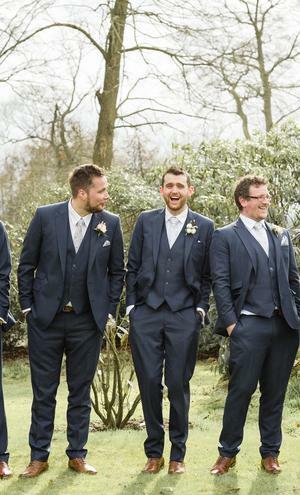 The groom and groomsmen got their suits from Focus, an independent menswear store in Belfast. The groomsmen were travelling over from France and arrived two days before the wedding. 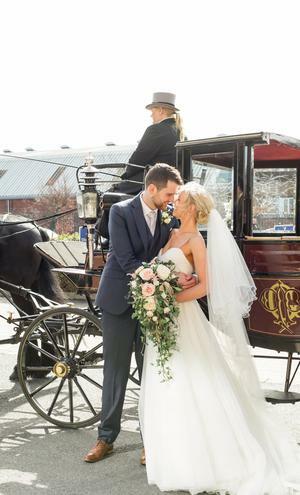 "We were really impressed with the range of suits they held and their ability to cater for out-of-town guests; they had everyone kitted out perfectly in time for the wedding day." For Suzi, her favourite moment of the day was when she arrived at the church in a horse-drawn carriage and saw her Year 1 and Year 2 pupils waiting outside to greet her. "It was such a special surprise!" she says. 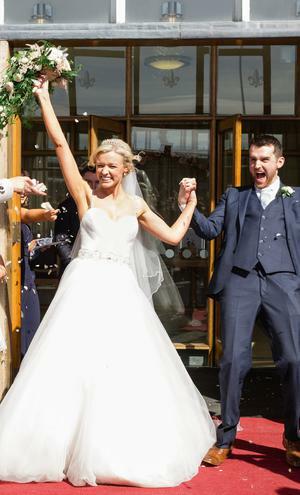 "I also loved our sparkler-lit first dance outdoors in the courtyard at Tullyveery House," she adds. Noah’s favourite moment he says was looking around the room during the meal, enjoying the atmosphere and seeing the couple's friends and family talking and laughing together. Suzi and Noah had a religious ceremony in Orangefield Presbyterian Church. Reverend Gary Ball officiated over the ceremony, while the couple's close friend David Varney shared a message to the congregation. They had a wooden cross in the centre of the stage, surrounded by cherry blossom trees. 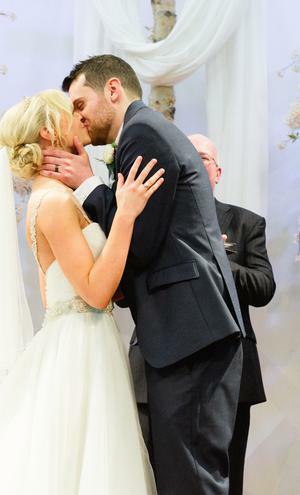 "We wanted our vows and the songs and readings we selected to be centered on God and our faith in him," says Suzi. 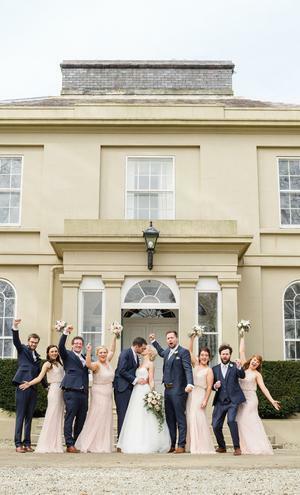 "Having looked around several venues, we loved the opportunity that Tullyveery House offered to create a completely personal wedding," says Suzi. "As well as having such a beautiful reception room and stunning grounds, we loved that we had the freedom to select our own caterers, decorations and entertainment. 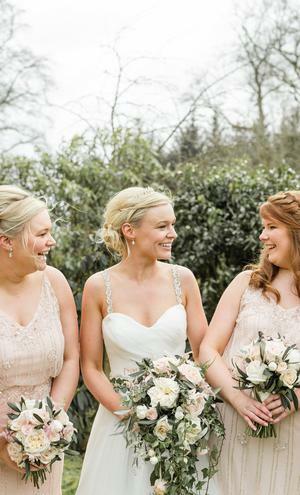 Colin, Heather and Gwen at Tullyveery House go out of their way to ensure everything runs perfectly on the day, leaving the bride, groom and their families free to relax and trust everything is taken care of." 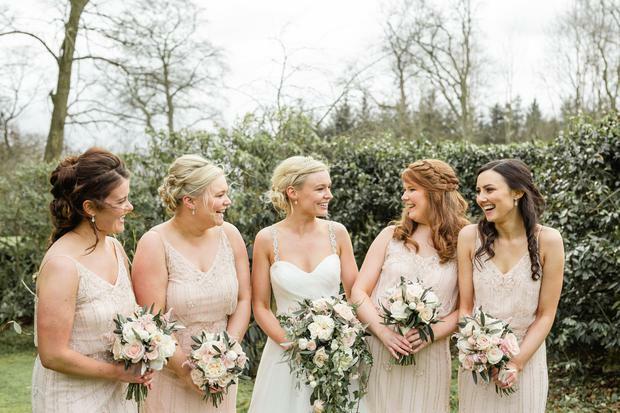 The couple's main colours for the wedding were blush pink and rose gold with lots of foliage. 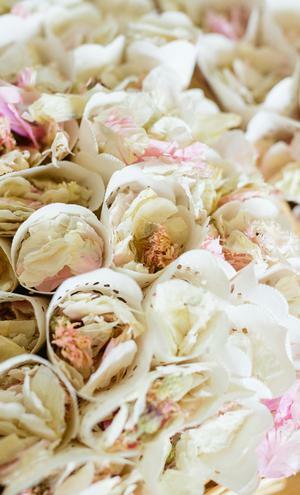 "While we left the larger aspects of food and decoration to the professionals, we had lots of help from our bridal party and families to create the invitations, centre pieces, floral hoops and homemade fudge for guest favours," says Suzi. 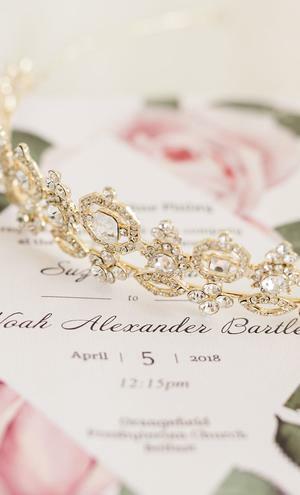 "We made our table plan by spray painting an IKEA clothes rack rose gold, decorating it with artificial flowers and suspending the guests’ names on invisible wire. Noah’s mum and my aunt also made delicious cakes for the evening party." Tori at Mandalay Weddings in Bangor created the stunning backdrop for the couple's reception at Tullveery House, using hanging ivy, a fairylight curtain and rose gold tablecloths and runners. "She was fantastic at pulling together our vision for the day," says Suzi.. When guests arrived at Tullyveery House they were greeted with raspberry and elderflower prosecco and a selection of canapes. 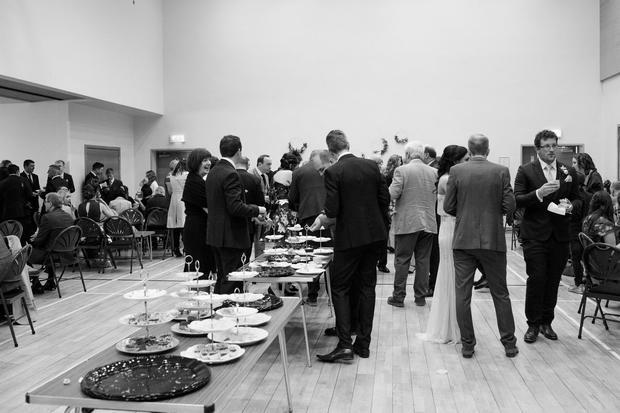 The couple used French Village Catering and NJB Corporate Bar Services for their catering. "We were delighted with the quality of service both companies provided and how easy they were to work with," says Suzi. For the main meal they had a charcuterie sharing platter with artisan breads to start, followed by a hog roast served with chips and salads. Dessert was a trio of salted caramel brownies, lemon meringues and apple crumbles. "Many of our guests commented that the sharing platters was very social and was a lovely way to begin talking with other guests at their table. 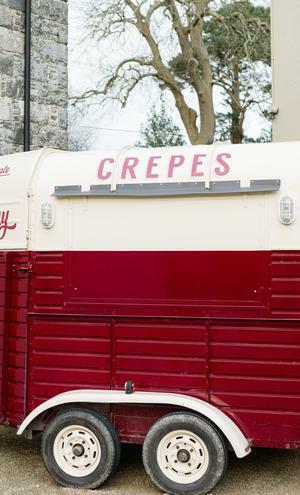 In the evening we had a crepe van outdoors and a selection of cakes baked by the groom’s mother and my aunt," says Suzi. "On the wedding day itself we were probably too concerned about what time it was and whether things were running on time," Suzi admits. "In hindsight we should have just ignored our schedule and focused on enjoying every moment of the excitement and joy with our families and friends!" 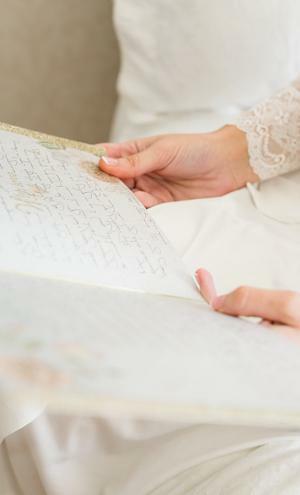 "Try not get too hung up on details," Suzi advises other couples, "decide what your priorities are for your wedding day, focus on those and be willing to be flexible over the smaller details. At the end of the day, no matter what happens with weather, flowers or food, you get to marry your best friend!" 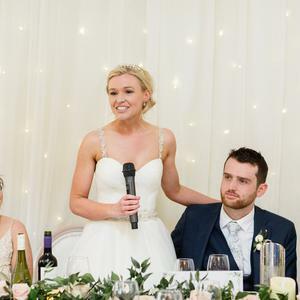 "Also," she adds, "don’t feel concerned that you need to make time to speak to every guest at the wedding – everyone understands what a whirlwind a wedding day is, so make sure you take time to get on the dancefloor with your new husband or wife!" For their honeymoon Suzi and Noah spent two weeks in Cuba - "and loved every minute!"